I’ve recently found a great article to share with you guys, it is an interesting theory written by SuperCrypto about the price supression we are currently in right now. In his post SuperCrypto says that besides the three dimensions we are familiar with (Technical, Fundamental and Manipulation), there is a 4th dimension called the Cartel where its primary goal is “price-suppression”. His research has strongly made me acknowledge that Cartel could actually be present in the crypto market when he called the Bitcoin correction of 95% before CME openned its doors. By his research the Cartel entered the crypto space somwehere in Oct-2017 with their presence showing the hour when CME Futures market opened its doors to crypto. 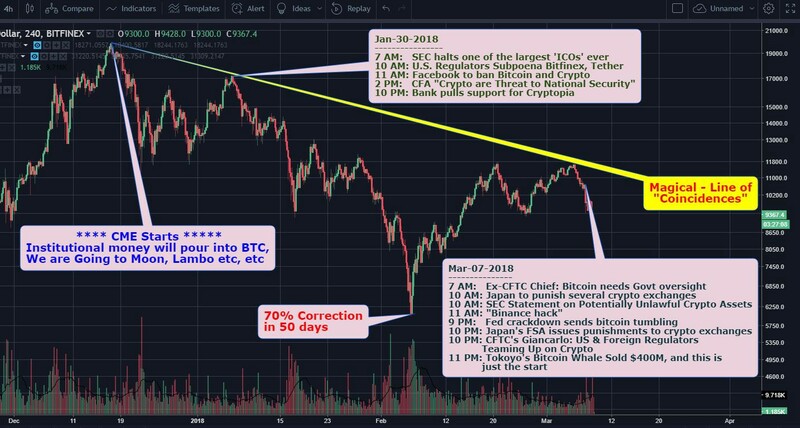 He also correlates the price movement with series of bad news coming all together on the exact same day, driving the prices into a deep correction. Uranium rose from 5$ to $133 from 1993 to 2007, same happened to it when they introduced Uranium Futures in may 2007. I suggest you to continue reading further here for a better understanding of the fact that we are possibly in a suppressed market where big entities have gathered to gain control of Bitcoin, by turning the market in a downtrend in order to buy in at cheaper prices.